When I was asked to review Spencer & Rains CD/DVD release The Spotted Pony last year, I was neck deep in my own journey absorbing early Appalachian music and not knowing much beyond “contest-style” Texas fiddling, was not particularly interested. That said, I gave it a listen and was instantly, for lack of a better word, “smitten” with the sublime music of this husband-wife duo. When they gave a concert in Los Angeles with their full band “The Skeleton Keys,” this past February, I bought their entire catalog; something I haven’t done in 30 years and honestly, these 5 records have dominated my playlist rotation all year. No surprise that their latest release The Skeleton Keys is every bit as brilliant and I have hardly listened to anything else over the past few weeks. This latest record continues to highlight rare early fiddle tunes and songs from Howard’s native Texas and Tricia’s native Kansas. From the opening track Get Up in the Cool from seminal Texas fiddler Eck Robertson, the record highlights some great and deliciously funky, crooked regional fiddle tunes from what Tricia coins “The Midwest Corridor”. 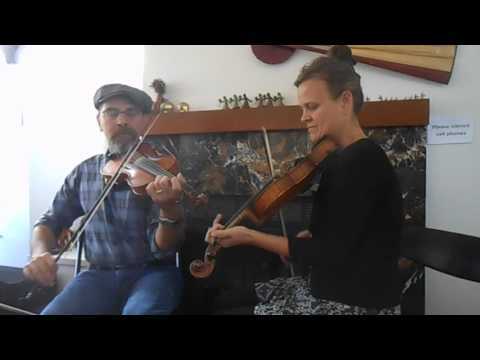 Worth noting are Tricia’s grandfather, Vernon Spencer’s Stony Point; Bob Wills’ Gone Indian; Duck Wootan’s Creek’s All Muddy, which has quickly become an Old-Time jam session staple; and three from Claude Parker including the powerful dual fiddling on Big Powwow which might be my favorite instrumental on this recording. Several waves of 19th century immigration from central Europe brought old world dance tunes, accordions and beer brewing to Texas and The Skeleton Keys closes with Oberek, a delightful Polish-Texan instrumental featuring Howard on button accordion. You will also find a healthy mix of better known Old-Time chestnuts; albeit rare versions from lesser-known musicians. Included are delightful renditions of Cumberland Gap, I Truly Understand, Sugarbabe (Red Rocking Chair) and Miller Boy, a variant of Bonaparte’s Retreat from the playing of Ozark fiddler Earl Collins who later lived in Los Angeles where he mentored numerous local Old-Time musicians, including Tom Sauber who gave this tune to Tricia & Howard. A few personal favorites include an eerie, goosebump-inducing version of Lead Belly’s Where Did You Sleep Last Night (In the Pines); a raucous Walk Around My Bedside from Roscoe Holcomb which is later re-appropriated as a dirge; and the Gant family classic When First Unto This Country which has been a favorite song for decades and even more so now. In addition to Tricia & Howards’ tremendous trademark fiddle and vocal duets, they are joined by their full band The Skeleton Keys featuring Charlie & Nancy Hartness from Athens, Georgia on uke and guitar respectively along with Bay Area musicians Emily Mann on upright bass and the stellar banjo playing of Brendan Doyle. Backed by this powerhouse ensemble, the arrangements are fantastic with a lot of gripping dynamics and harmonies. The Skeleton Keys also features Howard on guitar and accordion and Tricia on banjo-uke and bass. The fiddles played were inherited from Tricia’s grandfather and Howard’s great-grandfather, respectively. All the amazing music aside, The Skeleton Keys is equally a great work of art. Every track is graced with a collaborative portrait, featuring Howard’s lovely water colors and Tricia’s fabulous pen and ink borders. In addition, Tricia’s cover art and the amazing mandala that serves as the actual disc art really polishes off what is certainly a ground-breaking project in Old-Time music. The full color 40 page Skeleton Keys book also includes detailed liner notes and don’t miss the fine print, complete with whimsical anecdotes and their family recipe for oatmeal! The Skeleton Keys marks the 9th release from David Bragger’s and Rick Hocutt’s Old-Time TIki Parlour and available on the Old-Time Tiki Parlour website. Additional music and art from Tricia Spencer and Howard Rains music are available on their website.